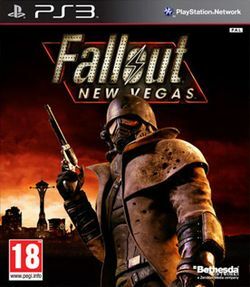 Fallout: New Vegas is a role-playing game in the Fallout series by Obsidian Entertainment (many employees of which worked for Black Isle Studios on Fallout and Fallout 2). It was released in North America on October 19, 2010, and on October 22, 2010 in Europe. New Vegas takes place 2281, 204 years after the Great War of 2077, which, after several nuclear bombs were dropped, left North America virtually destroyed. However, thanks to a company called Vault-Tec, many people were sheltered in Vaults which shielded them from the blast. After re-emerging, people set up communities again, often in abandoned and partially destroyed towns, having to fight raiders - people who turned savage after the destruction of civilisation - and mutated animals. As a courier, you have been tasked with bringing a package to New Vegas.